See Great White Sharks up close! 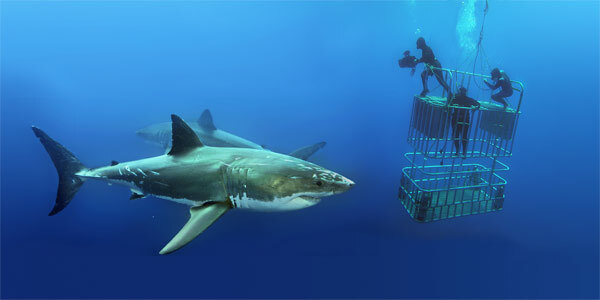 Guadalupe Island (Mexico) is the top destination for encounters with great white sharks! This small volcanic island is located in the Pacific off the west coast of Mexico’s Baja California peninsula. Only Guadalupe Island can boast shark viewing in beautiful clear blue water with 125 – 150 foot visibility. Join us on an adventure of a lifetime, observing great white sharks in their natural habitat. Spend 5 nights aboard the Nautilus Explorer and travel to the small volcanic island of Guadalupe, located 150 miles off the west coast of Mexico’s Baja California peninsula. Once there, we’ll spend 3 days cage diving in the beautiful, clear, dark blue water which provides over 125 foot visibility, giving the best shark viewing conditions of any location in the world! Nautilus Explorer was custom built for divers – designed with heavy, strong steel construction and sound proofing to offer the highest possible level of comfort and safety. The crew takes exceptional pride in keeping the boat clean and running smoothly. There are 4 cages at varying depths for virtually unlimited opportunities to be in the water with these great creatures. Nautilus Explorer offers a rich and natural experience of shark encounters on these trips by descending to where great white sharks naturally spend their time. They don’t need to use chum at depth; the sharks are already there. Without chum these great whites are more relaxed, exhibit MUCH more curiosity, and come in MUCH closer to the cages. This is a great place to become educated about sharks with our Shark Aware Class or continue your education with many of the Specialty Courses we offer. -Airfare to/from San Diego (Plan to arrive in SD no later than 3 p.m. on October 10. Return flights should be no earlier than 8:30 p.m. on October 15.